As parents, we have our work cut out for us. Its hard enough to get kids to eat healthy foods like fruits and vegetables when their taste buds are hardwired to prefer donuts, french fries, and pizza. Yet even if were lucky enough to have kids who dont reject every green thing served to them, many of us find we simply dont have the time to prepare healthy, nutritious foods every single day. Thats why so many moms, dads, and kids have come to rely on Juice Plus+  the next best thing to fruits and vegetables. On his CD/DVD Nine Simple Steps for Healthier Family Diets, Dr. Bill Sears discusses the importance of eating a rainbow of colorful fruits and vegetables, consuming good sources of fat like salmon and avocados, starting your day with a 'brainy breakfast', and adding Juice Plus+ to the family diet. You can watch a short clip of Dr. Sears below and his DVD in its entirety here. 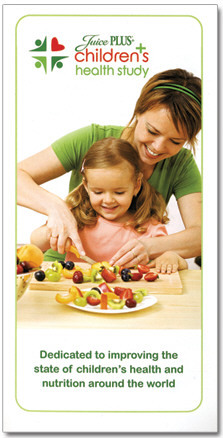 Dr. Sears is on the Advisory Board of the Juice Plus+ Children's Health Study. 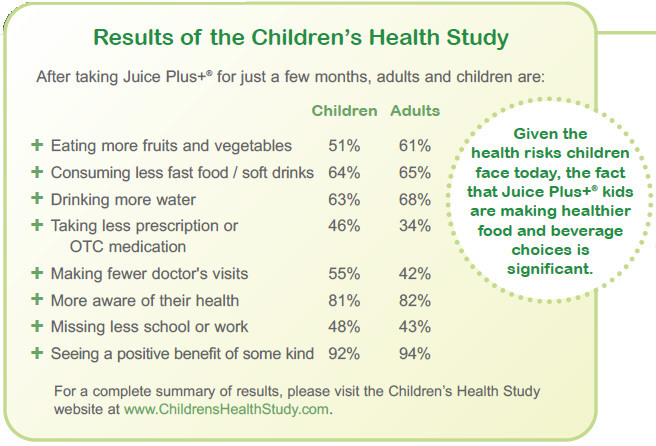 Established in 1999, the Childrens Health Study is a large-scale, multi-year survey designed to formally document the effects Juice Plus+ has on the health and wellbeing of families who take it. The way it works is simple. For every parent, grandparent, or other adult who signs up as a Juice Plus+ customer, the study provides Juice Plus+ capsules or soft chewables free to a child (aged 4 and up), teenager, or full-time college student for up to three years. At various intervals the adult participant is asked to fill out a voluntary survey to determine whether (and how) their families health habits have changed as a result of taking Juice Plus+. Based on the responses of more than 100,000 families who have submitted completed surveys, taking Juice Plus+ has far-reaching effects on health and well-being. Why are these results so significant? They arent eating enough fruits and vegetables. 93% of children and adolescents do not consume the recommended amount of vegetables per day. They have a weight problem. One in three American children and teenagers is overweight or obese. Obesity rates have tripled among teens since the late 70s. 80% of children who are overweight at ages 10-15 become obese as adults. Theyre already developing serious diseases. One in three children born in the U.S. in the year 2000 is predicted to develop type 2 diabetes. By age 12, an estimated 70% of children have the beginning stages of hardening of the arteries. Todays generation of children may be the first in two centuries to actually live shorter lives than their parents. Juice Plus+ is the only nutritional product Dr. Sears personally takes and recommends to patients and friends. Please enjoy the video below as Dr. Sears guides your family to new levels of health.